UBER: IT’S NOT just for cars anymore. Less than a decade after launching, it has rolled out rides for the normies (UberX), for those who don’t mind sharing (UberPool), and for those who don’t mind walking (Uber Express Pool). It offers on-demand grub (UberEats) and connects truckers with stuff that needs trucking (UberFreight). This week, the company acquired Jump Bikes, which puts people on shared, electric bicycles. Now, Uber is announcing a pair of moves that expand its reach to two more forms of transport. 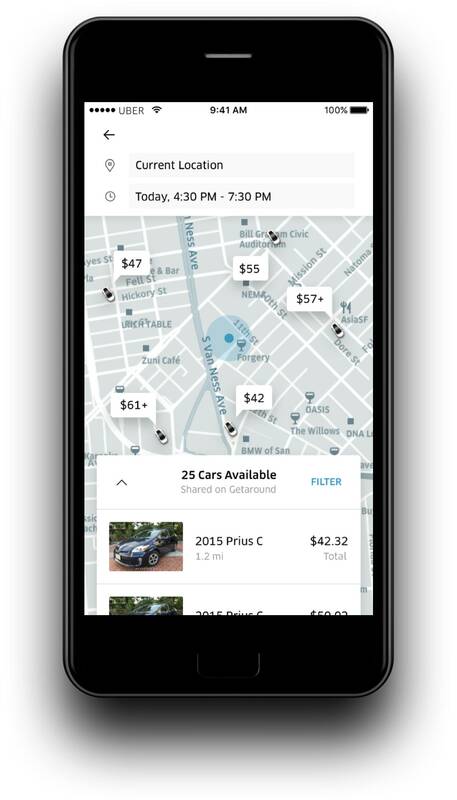 The first is a pilot project in San Francisco that will let users rent a vehicle from within the app (that’s called Uber Rent), via Uber’s partnership with the peer-to-peer car-sharing startup Getaround. The second is a deal with Masabi, a British company that provides mobile payment options for public transit systems in New York, Boston, Los Angeles, and other cities around the world. Within the year, riders will be able to buy and use tickets from within Uber’s app, too. “If you really want to provide something that can replace the car in people’s lives, you want to have more than ride-sharing,” says Andrew Salzberg, Uber’s transportation policy chief. A family that really wants to give up their vehicle (or their second vehicle) can’t depend on UberX alone. It’s too expensive. But now, mom could reserve an electric bike for her commute back home, dad could rent a minivan for his biweekly grocery trip, and the resident teen could order delivery because she hates dad’s cooking—all while that weird cousin borrows the actual family car to go on a camping trip. And come the weekend, the whole clan could reserve train tickets to visit grandma in the suburbs. They could all do it without leaving the Uber app. Call it … UberLife. Uber isn’t the only company thinking about capturing the entire transportation network. Last month, BMW and Daimler announced they would combine on-demand taxi app and car-sharing options. General Motors is slowly expanding its car-sharing (and electric car-sharing) options. Ford has started calling itself an “operating system” for various ways of getting around. The startup Ridescout, which sought to aggregate lots of mobility options onto one platform, got acquired by Daimler but took its app offline last summer. So no one’s owned city routing, booking, and payment in a convincing way, not yet. Uber and its competitors are betting that time is now, for a few reasons. First, Uber itself helped change people’s feelings about sharing stuff. (Remember that initial panic of riding with strangers?) Second, the smartphone has enabled a suite of GPS-powered services that help transportation options get to you, or you to them. Third, Uber is willing to pour a lot of money into the enterprise, to force broader mobility services into being. “We have a lot of wind at our backs,” says Uber mobility product head Jahan Khanna, noting the global explosion of mobility services like dockless bike-share, car-share, and scooter-share. “But what you really need to do is invest behind the modes. Jump is a way we’re looking at that. You need to build an ecosystem such that the multimodal networks add up to more than the sum of their parts.” Uber’s got money, a brand, and an app with millions and millions of monthly active users. If anyone can make it all work together, Uber thinks, it’s Uber. If the company can pull this off, it can start thinking about the really big idea: a bundled subscription. Pay a monthly fee, and get discounted rides by car, bike, scooter, bus, or whatever else people are into in a year or two. That way, it’s cheaper and so, so much easier to devote your family to mobility services instead of buying and maintaining a car (or two). The move into other sorts of mobility also gives the company a bigger stake in the future of the city—and the wider transportation network that supports it. Double-parking ride-hail drivers have long plagued cyclists. The Jump acquisition puts Uber on both sides of the conflict. Uber hasn’t said whether it will lobby for more bicycle and car-sharing infrastructure (or more permissive electric bicycle laws where they’re currently prohibited) but execs say that’s something they would explore. With new CEO Dara Khosrowshahi at the helm, the company seems eager to reposition itself a Silicon Valley unicorn suddenly willing to play by the rules. (Uber also announced Wednesday a 12-city expansion of its Movement tool, which passes mildly helpful transportation data onto city planners.) “We share many of the same goals as the 600 cities we serve, and are committed to addressing the same challenges: reducing individual car ownership, expanding transportation access and helping governments plan future transportation investments,” the CEO wrote in a blog post heralding today’s announcements.